My Mom gave me an old black and red sock for my puppet. First I put the eyes on the toe of my sock so my puppet could see. Then I put felt on the sock as a tongue. Finally, I put wool on the sock as hair. I hung it on the art line to let it dry. Daragh O Keeffe, junior infants. I brought an old sock from home. First I put the tongue on the puppet using a piece of felt. Then I stuck eyes on the puppet. Finally, I put wool on the puppet to make hair. We hung them in the classroom to let them dry. When they were dry I had great fun with it. Charles Mc Cann, junior infants. If you follow these steps you will grow a beautiful plant with a sweet fragrance. – Container, something like a carafe, in glass, or a stylish container. 1. Find a suitable container. A narrow-necked container with a broad base is ideal. It is great if it is glass but a stylish container of any sort is excellent. 2. Fill the container up to the neck with water. 3. Place the bulb in the shallow top part of the container. 4. Keep in an area of low light to allow for growth of the roots. 5. Shift the container to a brighter place once there is strong root growth in place. 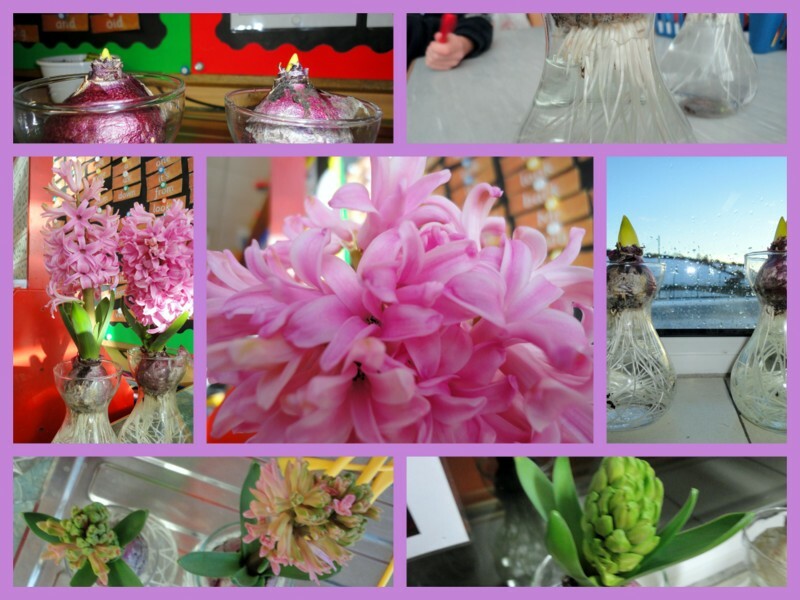 From this point, the bulb will continue to grow into a complete hyacinth plant. Enjoy the fragrance of the plant. Once the hyacinth flowers are in place, the scent will be delicious. Take advantage of the portability of the container to move it around the house as wished; from the dinner table to the lounge, etc.